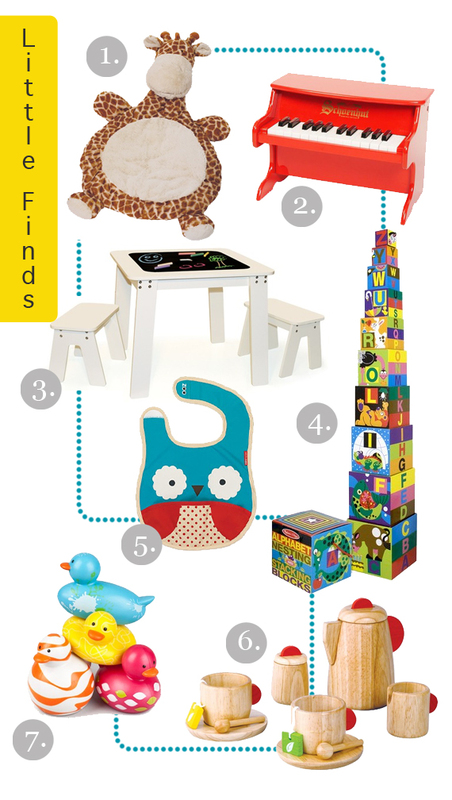 Here is my second round up of fun finds for the little ones I found on Wayfair. Hope to do more of these in the future! Its nice to hear from other mamas what their top choices are! I learn from you gals! 1. Giraffe Babymat – This is going on the wishlist for our next little one. Soft, plush, and safe for the new babies, as well as a great lounge mat for when they are older! 2. My First Piano – My son is really into musical instruments right now. Drums, xylophone, harmonica, you name it! When I saw this I immediately thought of him and how much he would enjoy this. I love to encourage music and art at the toddler age because its so beneficial for their cognitive development. 3. Chalk Table – I have this dream of having an entire room dedicated to art for the kids. I don’t think you can do too much music and art when they are young. Gabriel has been sitting at the table for hours lately painting, coloring, playing with play-dough, etc. He would probably never want to leave this table. 4. Alphabet Nesting Blocks – I can’t say enough good things about these stacking blocks. After seeing Gabriel play with them at an early age and learning to stack the blocks as well as practice his ABC’s on them, I started giving these as gifts to friends as well. They are easy to stack, easy to story, and are super affordable (on sale for 9$!). 5. Skiphop Bib – Now that Veronica has discovered cheerios, we are on our way to table foods;) After doing way too much laundry last week filled solely with her clothes caked in biscuits and cheerios, I decided it was time to get a few of these bibs. Large, water resistant, and has a catch all food pocket. Score! 6. Wooden Tea Set – I am counting down the days till I can have a tea party with Veronica. I think I might have to get more than one tea set. I love wooden toys and how durable they are, so this tea set I could actually have tea in;) And then of course, we will have to get a Little Play Kitchen to go with! Hope you enjoyed this little round up! I’d love to here your children’s faves! that piano is very cool! the color adds to its coolness. that piano is amazing. and paisley has those stackable blocks and LOVES them! good finds. We love duckies at the Kell house! I love that giraffe babymat! And the wooden tea seat is precious! my nieces are all about tea parties these days. It is SO cute! i love that little chalkboard table. Great finds. That little piano is so sweet. I love your picks! Especially the art table – so cute! the owl bib is ridiculously cute!! Such great finds! Love that giraffe babymat and the bib. Ah baby things are just too darling, aren’t they? Great picks! I absolutely love the chalkboard table! oh! Zoe loves those nesting blocks. She loves them and we take them everywhere we go. She’s ripped off some of the paper so I plan to modpodge some of our family photos on them to make them personal. And that skip hop owl was the theme of her first birthday party. Great finds! Gonna have to get me #1 and #6! Im so geting that chalk table when I have a little one! Great list! My kids had a little piano exactly like #2 and they played with it constantly. I love musical toys. Great ideas!! That plush giraffe is the cutest 🙂 Loving those bibs, they really do work wonders for the Little Ones and their messy feeding time!! That “My First Piano” is so cute for the budding musician!! I have a little cousin who I think would love it. These are the cutest! You have a knack for finding the most adorable things! I bought my daughter the same piano two years ago and just recently shared it on my own blog! What’s great about it is that it does sound like a real piano and it looks so great you can place it in the living room!